Historical Society memberships are just $10.00 for an Individual or $15.00 for a Family. Memberships are an easy and valuable way to support the work we do at the Harmon Museum and they make great gifts! Become a member now by visiting the Museum's online store. 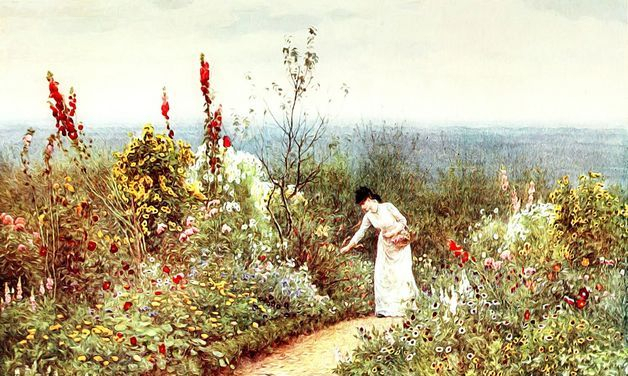 Image of painting by watercolorist Helen Allingham (1848-1926) by Prawny at Pixabay. 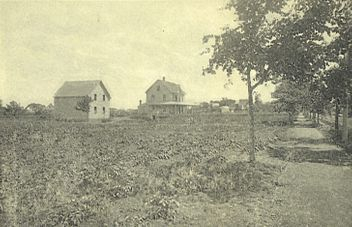 (Left) "Springhurst," the 1896 estate built by John C. Miles, Esq., originally covered 22-acres extending from Portland Avenue, behind what is today the location of the Post Office, back to the railroad tracks on East Grand Avenue. The estate's land and gardens furnished spring water and fresh vegetables to summer cottagers and many of the areas grand hotels. See what it looks like today. Is there a house, building or other historic or notable property in Old Orchard Beach you would like to see featured on this site? Let us know! My name is Ebenezer C. Staples, not to be confused with that other Ebenezer fella - you know, the one nobody likes, especially around Christmas time. On the other hand, I must confess that I do enjoy seeing my last name in big red letters up on the sign at those big-box business supplies stores. Most folks know me as the guy who built the Old Orchard Beach Inn (originally known as the Staples Inn) back in 1837, but that's not why I'm here. The real reason is to tell folks about my 1875 dust-up with still another Ebenezer, one who went by the last name of Seavey. You probably know me as the first person to fly across the Atlantic Ocean alone. You may know me as "the Lone Eagle." And, of course, you might know me as "Lucky Lindy." The story I'm about to tell you pertains to the "Lucky Lindy" nickname. You might say that if I had my druthers, I'd rather be "Lucky" than good. ABOVE: Charles Lindbergh lands on Old Orchard Beach on July 26, 1927 as part of his celebratory flight around the country after his historic transatlantic flight. Harry Jones, operator of an airport and flying service in Old Orchard from 1919-1933, is pointing something out to Lindbergh. On the right is reporter Philip Payne of the New York Daily Mirror, and on the left is a local police officer. 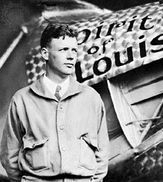 LEFT: Lindbergh in front of his plane, The Spirit of St. Louis. Please bookmark our website and return often to learn more about Old Orchard Beach's bright future and golden past!